Badrinath, located in the lofty Himalayan heights 10400 feet above sea level is a pilgrimage center held in the greatest esteem all over India. It is an arduous mountain route to Badrinath from Rishikesh or Haridwar in the Garwahl Himalayan region, where roads get blocked with landslides during the monsoon season. Badrinath stays closed for 6 months a year from Deepavali to the full moon day in the month of Chittirai (late spring in the Himalayas). Hot water springs of Taptakundam are seen on the banks of the Alaknanda at Badrinath and pilgrims take bath here before visiting the temple. The lofty peaks Neelakanta Parvatam and Nara Narayana Parvatam are visible from the temple. Periyalwar states that Vishnu enshrined in Mathura, Salagramam, Dwaraka, Ayodhya and Sree Vaikuntam is the same as the one (Purushottaman) enshrined in Tirukkandam or Kadinagar (Devaprayag). The Pancha Badri consists of five shrines devoted to Lord Vishnu. The five badris- Badri Vishal(Badrinath), Yogadhyan Badri, Bhavishya Badri, Vridha Badri and Adi Badri are revered by all.Most of these places are approachable by motorable road although trekking is inevitable in certain places. Badrinath temple is also known as Vishal Badri. It is the largest and the most popular of the pilgrimages among the five badris. The original temple here is believed to be built by King Pururava and the icon of the lord carved by Vishwakarma. The idol was recovered by Adi Shankaracharya from the waters of the nearby Naradakundam and consecrated once more in the temple , restored in the 19th century by the royal houses of Scindia and Holkar. The epic Mahabharatha is believed to be composed in the Vyasa and Ganesha caves close by. The Vishnu Ganga which later becomes the Alaknanda flows below the temple with Neelkanth Parvath on the other side. Mana Village is a fascinating village , the last habitation before the border with China, which once had a flourishing trade relations with Tibet. The Vasudhara falls are quite spectacular. Yogadhyan Badri is located at 1,920 meters in Pandukeshwar, named after the Pandava kings. It is believed that the Pandavas, victorious after their battle against the Kauravas, but emotionally disturbed came to the Himalayas. It was here that they handed over their capital Hastinapur to king Parikshit Raja and took up penance. The importance of this Badri is immense and the Lord is seen in a meditative posture. From the main road the temples can be seen and are located slightly at a lower level leading through a small strip of steps. The future Badri is located at 2,744 meters amidst the thick forest surrounding Tapovan. The local people believe say that the Nara and Narayana mountains in Badri are slowly drfiting and will collide with each other. The present Badri will be no more with such collision and landslides. 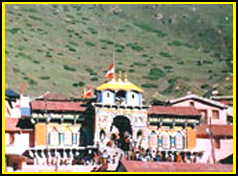 It is believed that it is here that all devotees will throng once Badrinath will be no more. Enshrined here is the self–forming image of the Lord. Bhavishya Badri is connected by a motorable road upto Saldhar, which is 19 kms from Joshimath. From Saldhar, pilgrims have to trek upto 6 kms. upto the shrine. The trek is difficult in very steep mountains with not very comfortable path. It is advisable to take the local people to lead the way and better to go in a group through the paths in almost a jungle. People who are comfortable in riding in ponies can do that from a village which is about 2 kms from the main road up to the hill. Villagers are very cordial and helpful and respect all the pilgrims who visit the shrine. It requires one full day to trek up and down the hill with frequent rests. Visitors pass the serene Tapovan known for hot water springs. This is the first Badri which is located at a height of 1,380 meters at Animath 8 kms short of Joshimath. It is believed that before Badrinath was consecrated by Adi shankaracharya, the idol of Badrinath carved by Vishwakarma was enshrined and worshipped here. It is said that when mankind entered the age of Kali, Vishnu chose to remove himself from the temple. 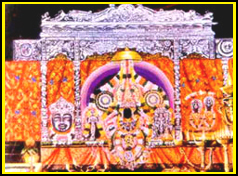 Thirumangaialwar - 968-987, 2673 (74). Prathyaksham Manthropadesham to Naran under the Ilandhai Tree. This Kshetra is about 5 kms from Faisabad station on the Mugulsarai - Lucknow route. It is found right back of Holy River Alaknanda. This Badrinath Divyadesam located is almost 10300 feet above sea level is a great Pilgrimage center in India.